Greeting card storage is the best way to organize your greeting cards by holiday or special occasion. Our greeting card storage boxes often come with dividers so organizing is easy. Easily find a Birthday card or Christmas card without rummaging through anything. 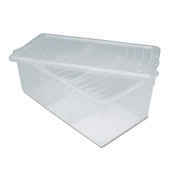 Our greeting card storage containers are sold by case pack so you can save big. Buying in case packs also lets you organize all of your greeting cards that may not all fit in one box. 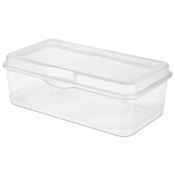 Get a Christmas greeting card storage box with a red lid or a plain clear one for all other special occasions. Our greeting card storage containers are stackable so you can save on space and keep all of your greeting card organizers together. The provided dividers also have label tabs so you can label each section by Holiday, making it fast and efficient to find that right greeting card. 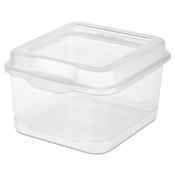 These greeting card storage boxes are also great for storing recipes, photos and your kids' drawings. So purcahse a case pack today and get all of your greeting cards, recipes, photos and anything else organized for cheap.